If you're trying to find a park model home that squeezes into a narrow lot, we've found the perfect one for you. 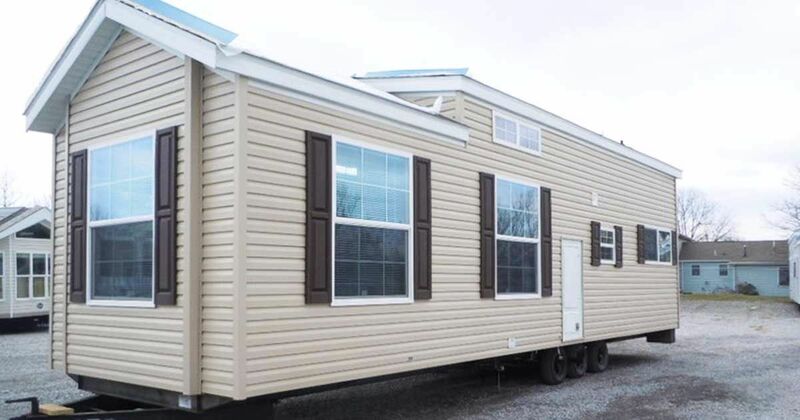 This 2016 Harmony park model from Fairmont is comfortably snug with a slim width, but don't be fooled by its appearance. 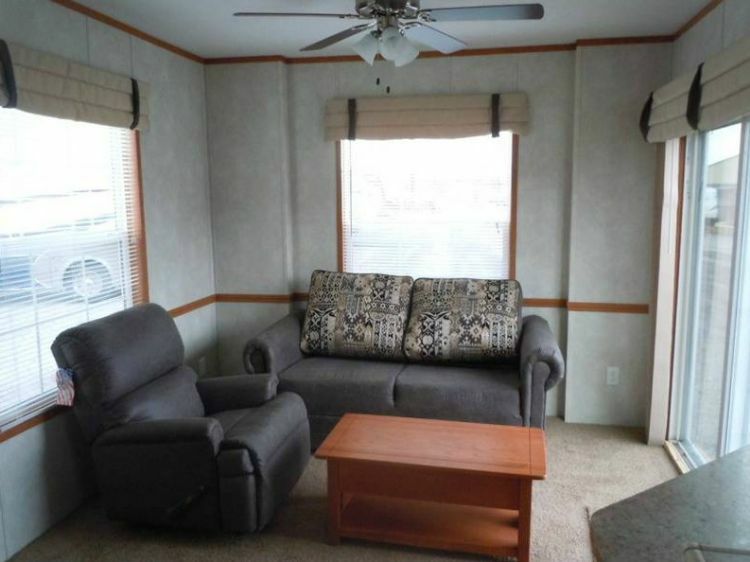 There's tons of room inside this spacious, yet space-saving getaway. 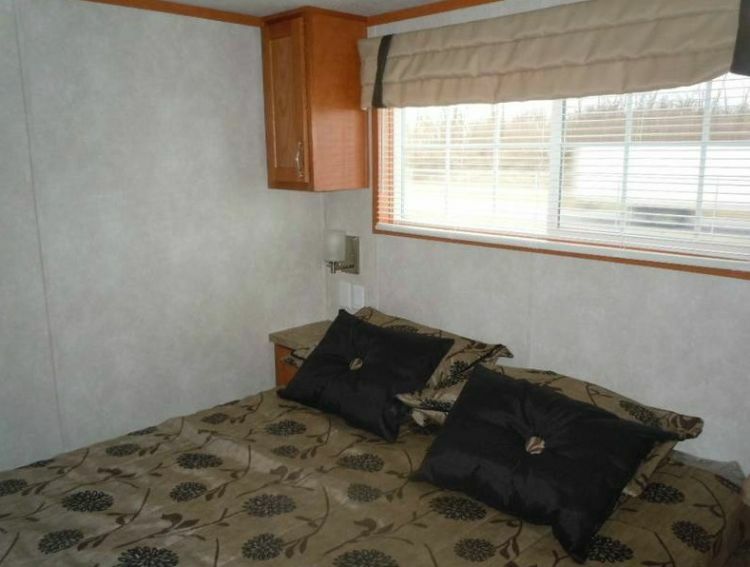 The 2016 Fairmont Harmony park model can be found on the sunnier side of Palm Bay, Florida at Suncoast RV Trailer Sales. Should you happen to live in the Midwest, they also have an Indiana location. The living room comes with a plush loveseat and armchair, but it's the coffee table that we just love. It's one of those models that lifts up with an adjustable height feature. It's great for a makeshift work area or extra dining space. Four seats around this tiny dining table seem like overkill, but the table expands to allow more room for guests. 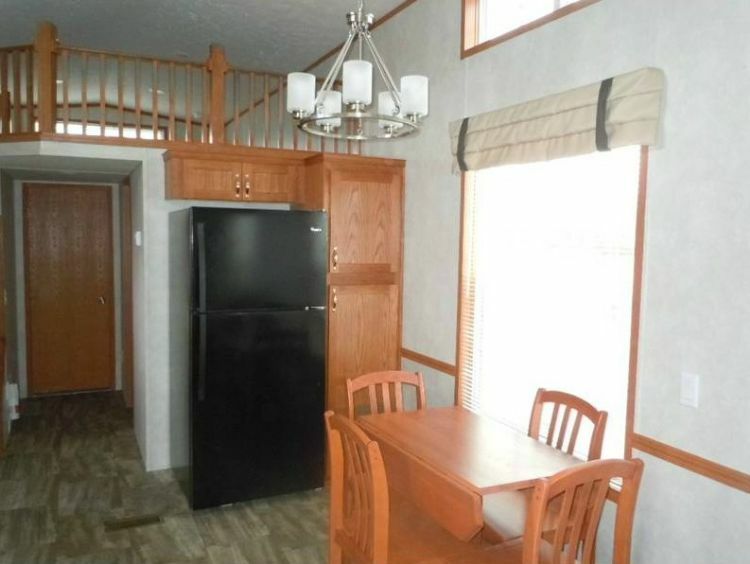 The refrigerator placement is handy for when you need to take something out and put it directly on the table for dinner. The open plan kitchen is unhindered by walls that usually close off the space, and anyone in the kitchen can easily chat with another person in the living room. 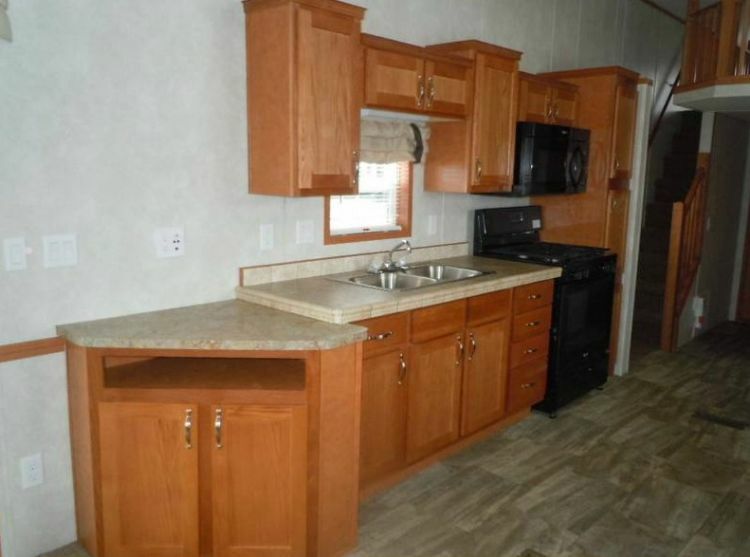 The park model comes with updated appliances, including a mounted microwave to save counter space. 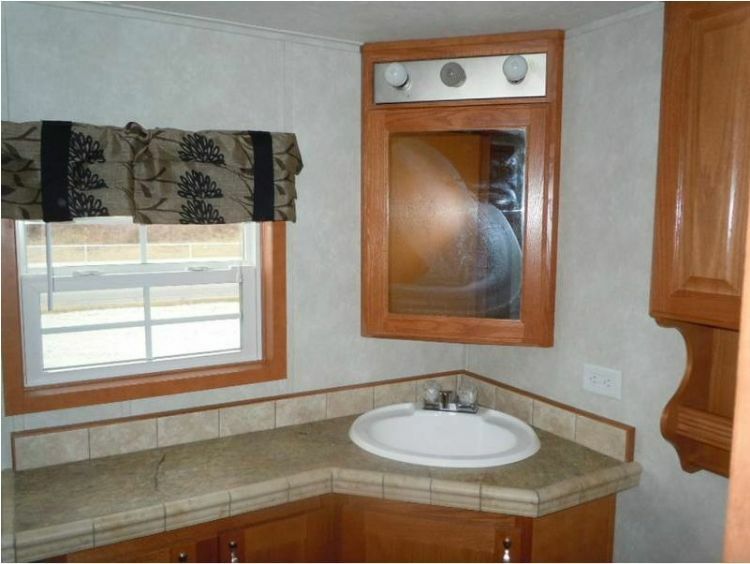 Speaking of counter space, there's a lot of it in the bathroom. A sliding door shower and plentiful shelving let you keep all of your bathroom necessities close at hand. Twin wardrobes and a queen bed make for a comfortable nighttime setup in the bedroom. There's even room for a TV if you don't mind blocking off part of the wardrobe mirror. 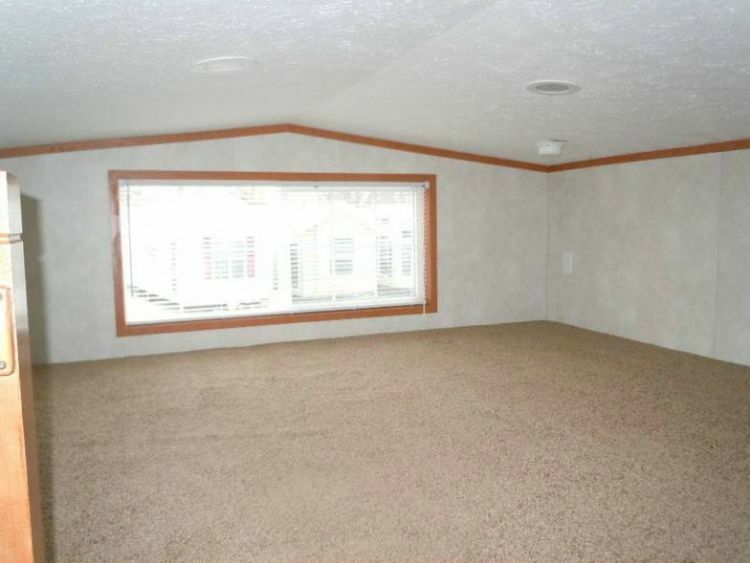 What the park model sacrifices in width, it makes up for with a large loft. It would be no problem to fit another couple of beds up there for guests or extra occupants. Share this classy park model on Twitter and Facebook. Like our Park Model World to see more fantastic park models like this one.